The pieces constructed by Norman Cherner are recognized today as an essential part of the emblem used to describe the essence of Mid-Century modern furniture design. He is considered to be one of the most original and imaginative designers to explore the technological innovations that began to emerge after the war, in both industrial design and architecture. Throughout his career, Cherner made a name for himself as a pioneer in prefabricated housing and molded plywood furniture. He both studied and taught at the University of Columbia, in the Fine Arts Department, and engaged in a period of instruction at the Museum of Modern Art, between 1947 and 1949. It was at this New York museum that he went on to examine the Bauhaus movement, which developed into a lifelong exploration of multidisciplinary design in various aspects of life, from glass wear, to lighting, furniture, and toys. Over the years, Norman Cherner (1920-1987) found his calling as a teacher, a housing designer, a pioneer of molded plywood, and a subject that sparked significant controversy. Today, he is well known for both his innovative approach to Mid-Century modern design, and his world-famous copyright lawsuit. Although he dabbled in creating glassware, furniture, shelving, toys, lighting, and even amazing architectural plans for the homes that developed after the war, Cherner is often remembered for suing the makers of the Cherner chair (also known as the Rockwell Chair). Beyond that, Cherner is a notable figure in design history, with several works on architecture and furniture published in his name. Today, he continues to be a prevalent inspiration for the affordability-minded design and architecture community. Although, in his time as a designer, Norman Cherner has styled many interesting pieces, the most intriguing and famous by far is the Cherner Chair. This chair allowed him to achieve the mantle of an unsung-hero within the realm of Mid-Century modern furniture design, and an innovator in affordable pieces and plywood construction. Perhaps most famous is the story behind this popular design. Originally, Cherner was known as an American designer and architect. He spent a number of years teaching and studying at the University of Columbia, before moving on to instruct at the MoMA, where he became steeped in the favored Bauhaus approach, where various aspects and mediums of designs were considered with interest. In 1948, Cherner started to produce low-cost, modular housing for the post-war region of upstate New York, alongside various affordable furniture pieces and decorative concepts. In the 1950s, led by George Nelson, the Herman Miller Company began work on a series of lightweight chairs constructed primarily out of plywood. Their well-known pretzel chair was designed by the office of Nelson during 1952, and then produced en masse by a company called Plycraft in Massachusetts. Although the design was engaging, the pretzel chair was quickly found to be too costly and fragile, forcing Herman Miller to stop production in 1957. However, because the Pretzel chair had already been conceived, the company still had the techniques and materials to construct plywood furniture, and did not want to waste them. George Nelson therefore suggested that Norman Cherner be asked to design a more affordable and sturdier chair that could be built using Plycraft’s equipment. After Cherner was hired and subsequently came up with a concept for Plycraft, he handed in his design to find that the project had been cancelled. A short time after, Cherner visited a furniture showroom in New York and saw that his design was up for sale. Assessing the label, he found that the item was produced by Plycraft and attributed to “Bernardo”. As a result, Cherner sued the company and won. Today, the Cherner Chair is still regarded to be one of the most famous and dramatic designs around which utilizes the technology of carefully molded plywood. 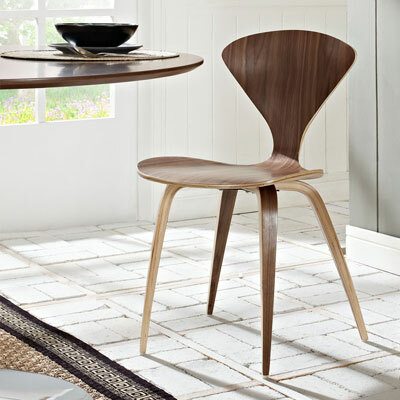 The Cherner Chair is stunningly crafted, with a distinctive and flowing design; all made using a singular piece of wood. Perhaps the most impressive part of the seat is that it is able to fit into just about any theme or style that has been chosen for an interior space. Whether you aim to achieve the sleek modern concept in your home and office, or a classic style, the Cherner Chair can blend effortlessly with its surroundings. This may be due in part to the fact that the Cherner Chair encompasses the minimalist ideologies of the Mid-Century modern furniture era. However, it is also important to note that the construction and material itself is stunningly timeless, providing an excellent finish to any room. Born in New York City, in 1920, Norman Cherner explored a vast world of Mid-Century modern design. His concepts include the Konwiser line of lighting and furniture, the multi-flex option for storage, and most importantly, the molded plywood Cherner Chair. 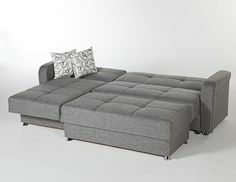 Just some of the works that he has published and written regarding design and furniture include: “How to Build a House for Less than $6000”, “Fabricating Houses from Component Parts”, “How to Build Children’s Toys and Furniture”, and “Make Your Own Modern Furniture”. Today, Cherner’s designs make up a significant and timeless portion of what came to be known as Mid-Century modern furniture design. His lighting, tables, chairs, and housing solutions have endured a history of long-standing popularity since they were introduced to the market in 1958. As the decades have passed by, Norman Cherner developed into an icon of Mid-Twentieth century design, allowing his work to be showcased in design collections and galleries throughout the world. Even the Vitra Museum has paid homage to his elegant and affordable works in the realm of furniture. It seems that as time progresses, Norman Cherner and the ever-famous Cherner Chair, will continue to hold onto a place in design history, and assist in influencing, inspiring and directing the designers of tomorrow. This entry was posted on Friday, March 13th, 2015 at 3:07 pm	and is filed under Mid-Century Designers. You can follow any responses to this entry through the RSS 2.0 feed. Both comments and pings are currently closed.